World leaders gather in Johannesburg for a memorial service for former South African President Nelson Mandela who died Thursday, December 5, at the age of 95. President and Mrs. Obama are leading the U.S. delegation. They will be accompanied by former Presidents George W. Bush, Bill Clinton and Jimmy Carter, as well as members of Congress and other dignataries. Mandela spent 27 years in prison under the apartheid regime, and then became South Africa’s first black president in 1994, after the nation’s first all-race elections. He served only one term in office. The former president had been ill in recent years and had not made a public appearance since 2010. He has suffered from a number of respiratory ailments, which many link to his time in prison, where he contracted Tuberculosis. His funeral will take place later this week. After learning of the news, President Obama made a statement to reporters at the White House, and recalled the impact Mandela’s writings had on his own life and career. UN Secretary General Ban Ki Moon also paid tribute to the the former South African leader. Mandela to be buried December 15 in Qunu, Eastern Cape. 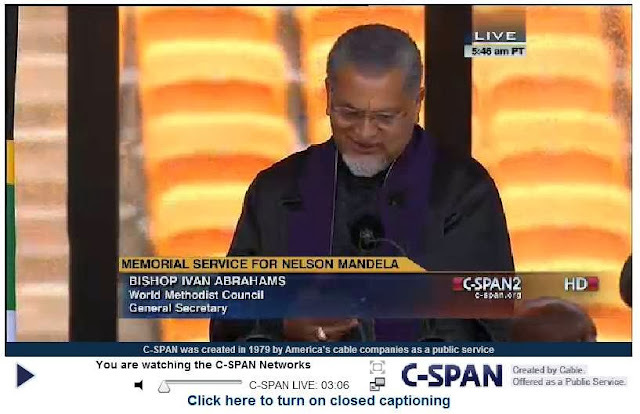 You can watch both statements here on C-SPAN.org and read tributes from other world leaders and U.S. public officials. “A great light has gone out in the world. Nelson Mandela was a towering figure in our time; a legend in life and now in death – a true global hero. Across the country he loved they will be mourning a man who was the embodiment of grace. Meeting him was one of the great honors of my life. “Today the world has lost one of its most important leaders and one of its finest human beings. And Hillary, Chelsea and I have lost a true friend.